October 14, 2016 By This post may contain affiliate links. Pipe a pretty swirl of orange, yellow, and white frosting onto your cupcakes then nestle the cupcakes in plastic wine glasses filled with candy corn. These colorful Candy Corn Cupcakes are easy to make and will dress up your Halloween dessert table. Have you ever piped a tri-color swirl of frosting onto a cupcake? When I decided to make these Halloween cupcakes served in wine glasses filled with candy corn I knew I wanted a big swirl of orange, yellow, and white frosting on top. To get that effect, I could have filled one big pastry bag with the three colors of frosting, but getting all three colors neatly into one bag can be tricky. Instead I used a Wilton Color Swirl 3-Color Coupler set. The set comes with three interlocking coupler pieces that together form one large coupler. With this set, you fill three individual 12 inch pastry bags with the three frosting colors making that process a lot easier. Then you attach a large pastry tip and screw on the purple cap. You can attach the three bags together using a rubber band or Wilton’s Icing Bag Ties. Once the bag is ready, you just pipe a big colorful swirl onto your cupcake. You can even just pipe a big blob and it will be colorful and fun. Adding a cupcake to a candy filled wine glass has become a popular trend and it’s so easy to do. Imagine all the possibilities with a color swirled cupcake. You can make them using your school colors, your kid’s favorite colors, or holiday colors. I thought the best way to show you how to use this cupcake decorating technique was in a video (see below). How are you liking my videos? I can’t believe I waited so long to start making them, but I’m sure glad I finally did. You can find products needed to make these cupcakes on Amazon.com (affiliate links). Cupcakes topped with a big orange, yellow, and white frosting swirl are served in wine glasses filled with candy corn. Divide the frosting into 3 bowls. Color one bowl of frosting orange. Leave the third bowl of frosting white. Spoon the orange into a disposable pastry bag fitted with one of the three Color Swirl 3-Color Coupler pieces. Repeat with the orange and white frosting. Fit the three interlocking coupler pieces together, add a large star pastry tip, screw on the ring. Tie the three bags together. Fill a plastic wine glass half-way with candy corn. 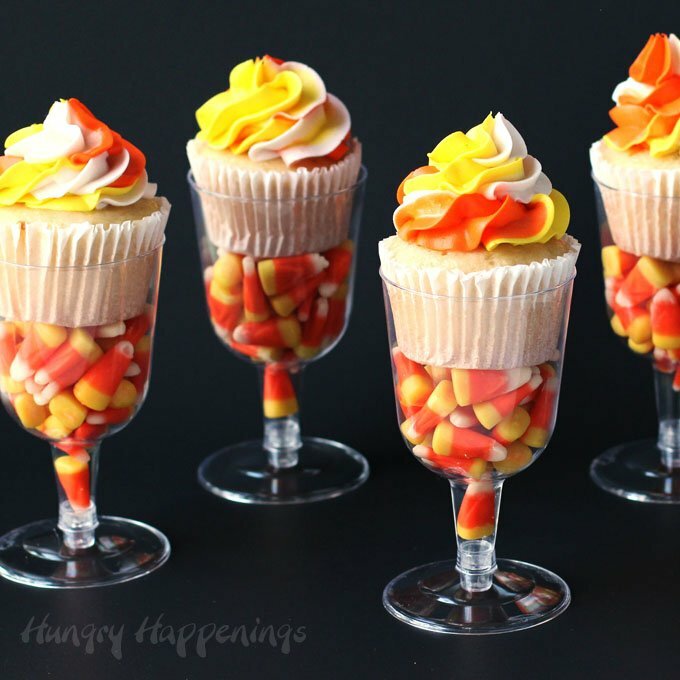 Just before serving, set a cupcake on top of the candy corn in each wine glass. Cupcakes are moist and candy corn can get sticky if wet, so don’t leave the cupcakes in the candy filled wine glasses for more than a few hours. Fill the wine glasses with enough candy so that the cupcake sticks out enough for you to be able to grip it to pull it out. You don’t want your party guests to have to dump the wine glass to remove the cupcakes. 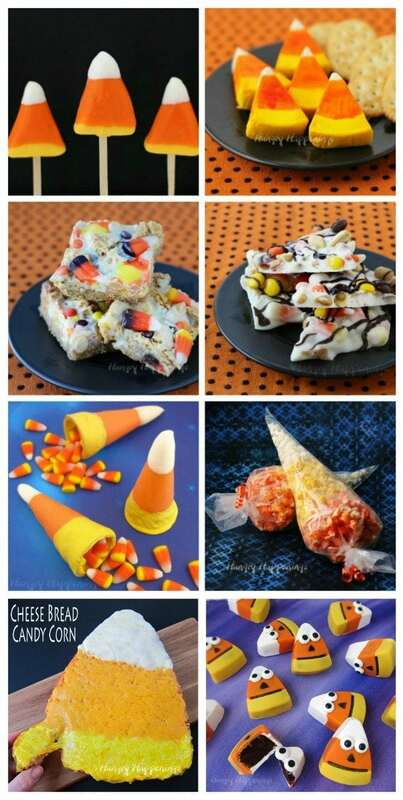 You might also like these other fun candy corn themed recipes. What a cute, clever idea putting cupcake in candy filled wine glass. Great item to make for any holiday or even for birthday, baby shower or anytime really. Thanks, Colleen. These are definitely easy to make for any occasion. I hope you give them a try. Where did you get the wine glasses? I got them at the Dollar Tree.